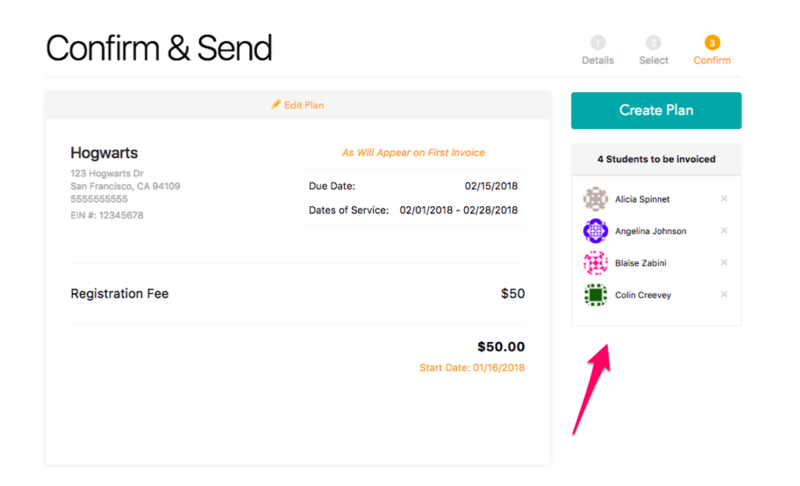 When you create a new plan you are setting up a schedule for our platform to automatically create invoices for your students. No need to log in and create the same invoice over and over! You can view your plans on your dashboard here. How To Create A Plan. 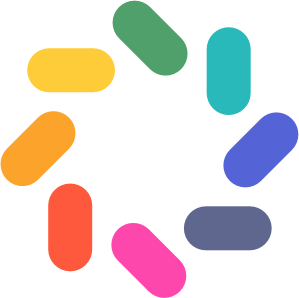 You have the ability to set monthly, bi-weekly, weekly, or twice per month plans. If you choose monthly, you will be able to decide on a due date between the 1st - 28th and the last day of the month. 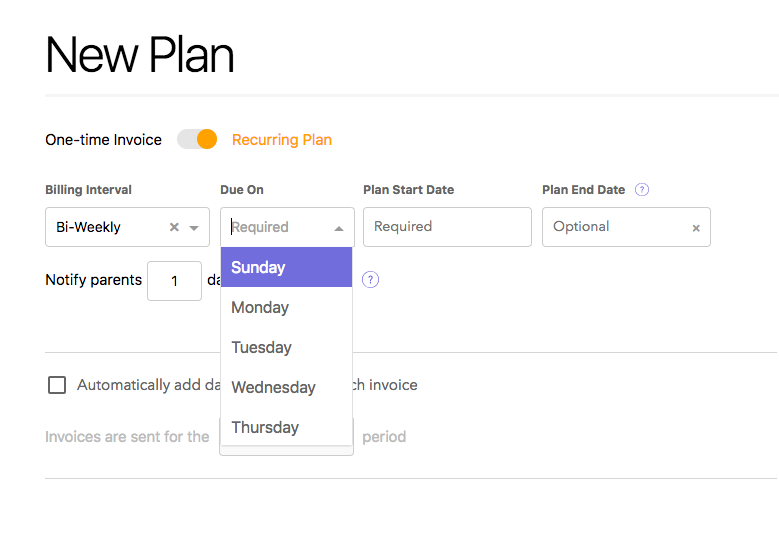 For weekly and bi-weekly, you can choose the day per week that the invoice should be due. Please note that bi-weekly means the parent will be invoiced every two weeks! You will also need to set the "Notify parents" date to determine when the invoice will be generated. 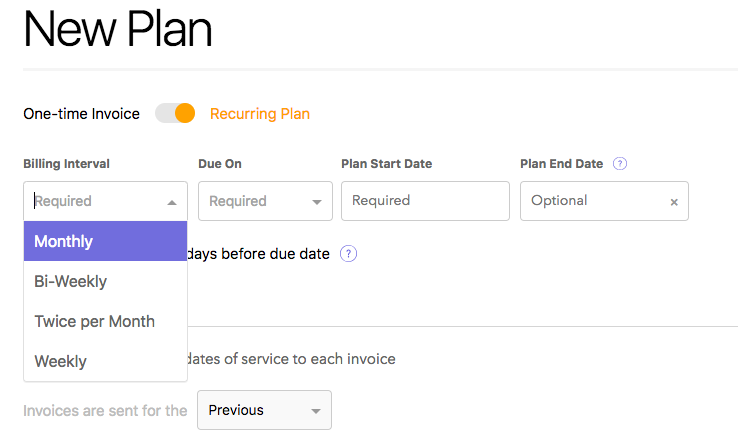 If you choose 1 day before the due date, the invoice will generate and notify the parent one day prior to the due date during the billing cycle. For monthly plans, you can notify parents up to 28 days prior to the due date. For all other plans, you can notify parents 7 days prior to the due date. In this screen, you will also be able to add additional line items and discounts. 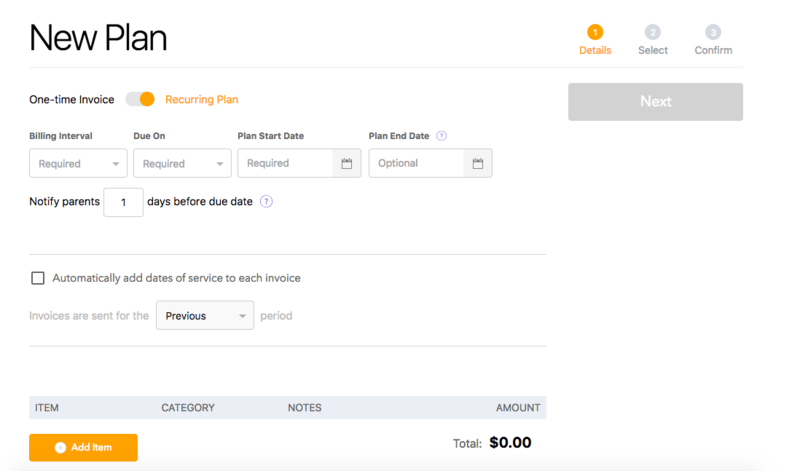 For details on how to create a new invoice item, please see this article! For details on how to add an existing invoice item to your plan, please see this article! You will then be able to select ALL students who need plans created with these parameters from the Select Students list. 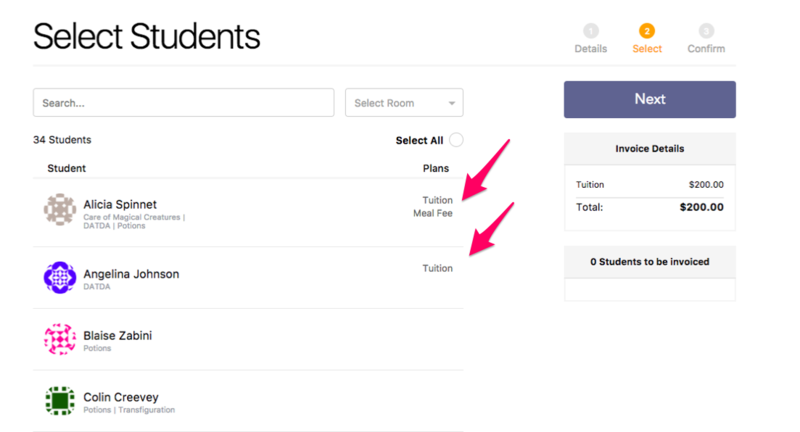 Please also note, you are now able to create multiple plans for the same student! In the image below, Alicia Spinnet and Angelina Johnson already have plans set up on the dashboard. However, the plan creator is allowing me to select their names again. 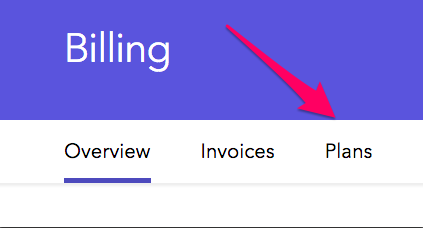 This is very useful in generating monthly invoices for multiple things. (meals, payment fees, etc.). The dashboard also shows which plans the students already have associated with their accounts! You will then be asked to confirm the details and send! 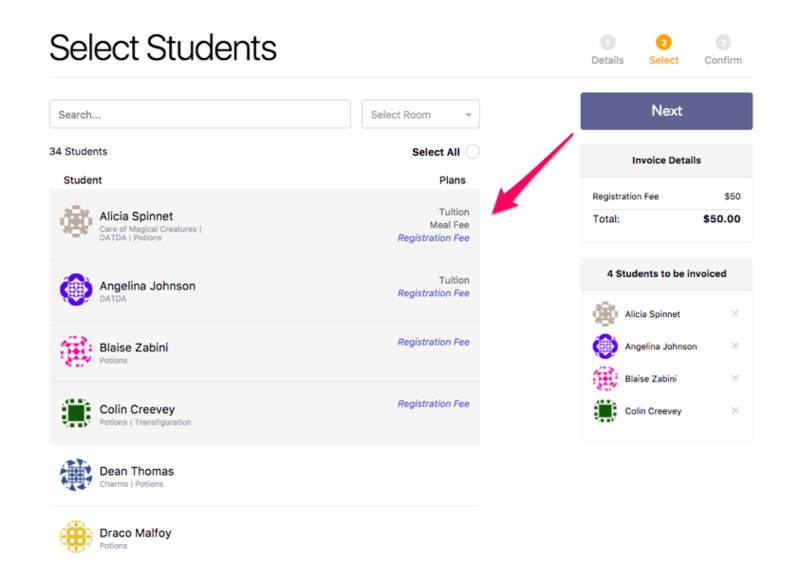 Once you have confirmed that all necessary students have been added, select Create Plan! 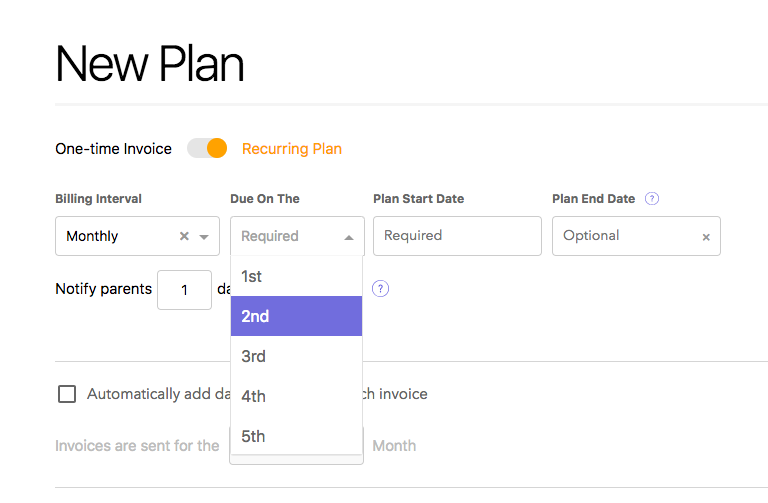 Once you have completed that process, you can head back to the Plans tab on the Billing dashboard and you will be able to see all plans created for your students. Please note that the billing interval and due date cannot be edited. If these need to be changed, you can cancel this plan and create a new one. If you are looking for information on how to create one time invoices, that can be found here.